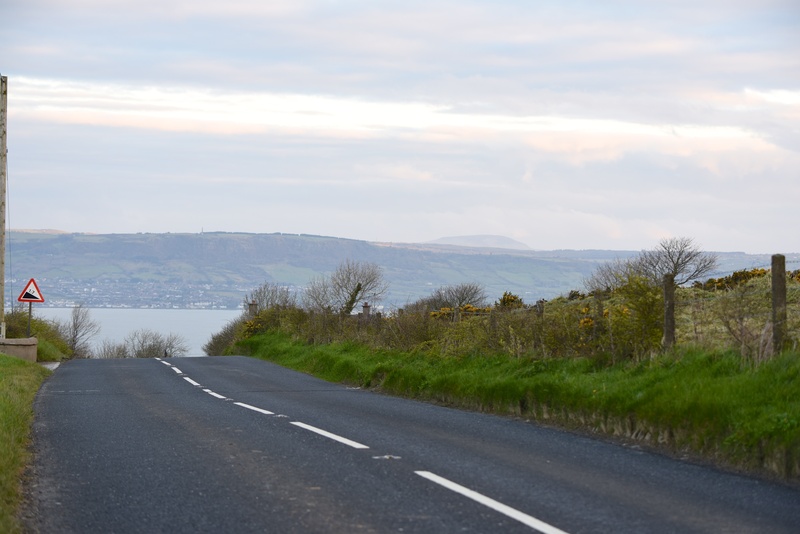 Today I fill in a gap between last week’s townlands of Holywood and Ballymenagh. The missing link is the long, narrow townland of Ballykeel. I approached Ballykeel by from Ballyregan townland. This was the view from the top of the hill. 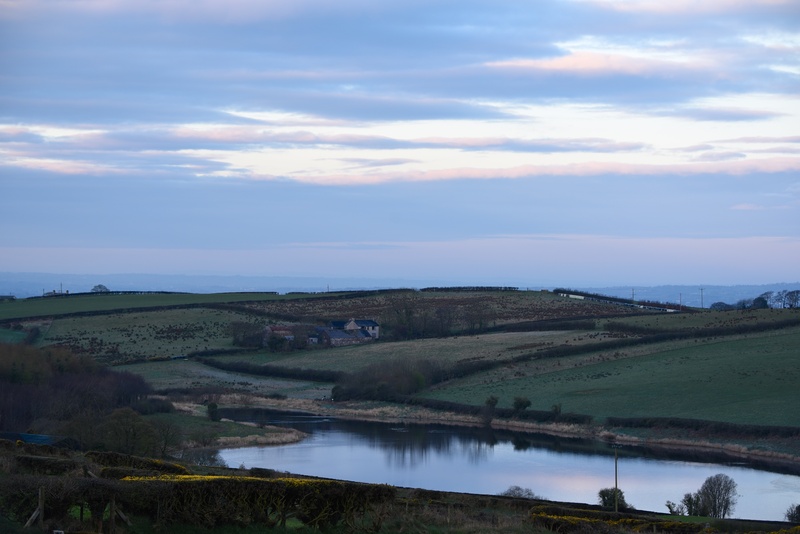 The fields on the far side of this reservoir are in Holywood townland. The next photo shows the view as I looked down the hill. I could see right across Belfast Lough to County Antrim and the summit of Slemish. There is no sign of the town of Holywood hidden below me. The red triangle is a warning sign for the steep gradient (1 in 7) of Church Road. It’s not just the road which falls down this slope. The river known as Twisel Burn flows down into the town, dividing the townlands of Holywood and Ballykeel. 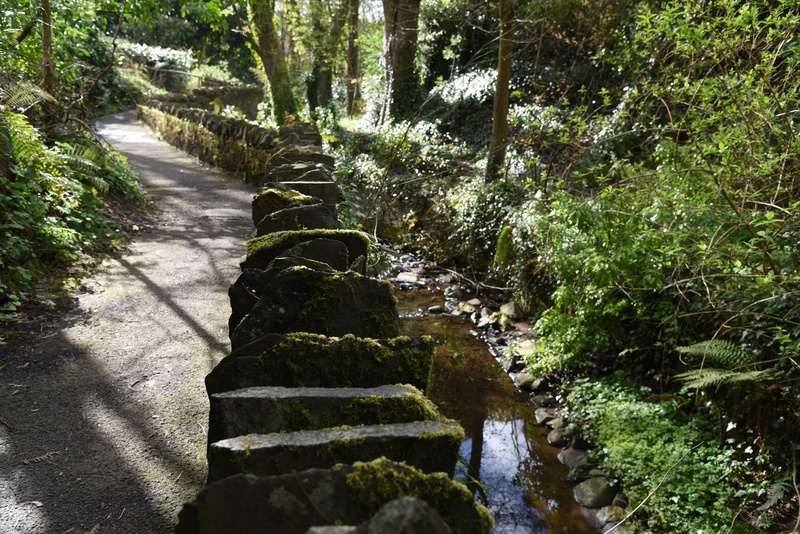 You can follow it on woodland paths at Twisel Bridge and Glenlyon Park. Another river – the Croft Burn – divides Ballykeel from the townland of Ballymenagh. 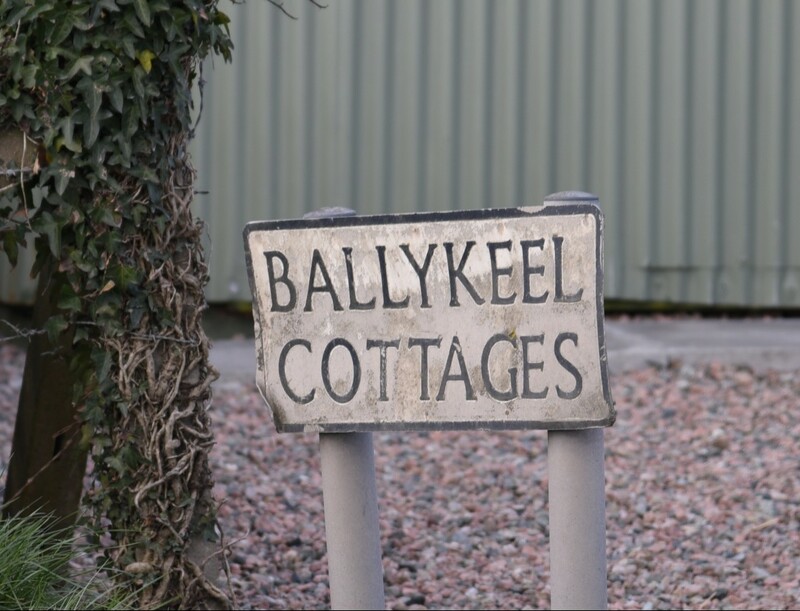 The name Ballykeel reflects the shape of the townland, according to the PLACENAMESNI website. They conclude that it comes from the Irish An Baile Caol meaning “the narrow townland” or Baile an Choigil meaning “townland of the distaff” (which is another way of referring to a long narrow place). The narrow townland still manages to contain some impressive history, like Holywood Motte. 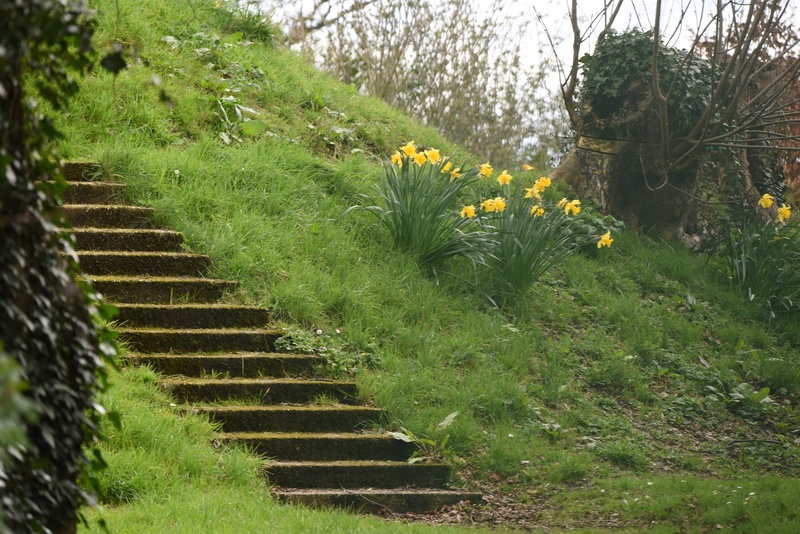 At one stage there would have been a fort on top of the mound, built by the Anglo-Norman knight John de Courcy, who took control of eastern Ulster in 1177 and built a series of fortifications (including one in the townland of Church Quarter, Dundonald). By the time I visited Ballykeel in 2016, the fort was gone, and the motte was defended instead by locked metal gates, so I couldn’t get any closer than this. My next stop was Holywood Priory. The tower in this photo dates from 1809, but some of the remaining walls go back as far the Augustinian abbey established at the end of the 12th century. 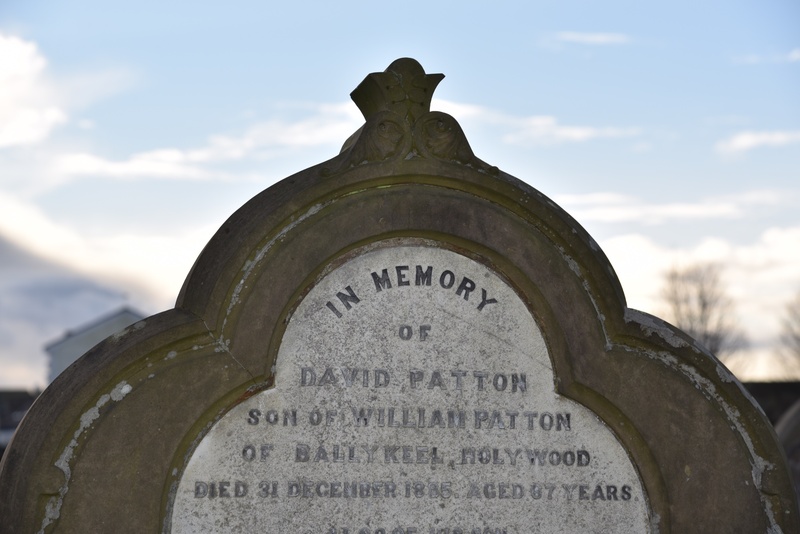 Among the graves in the Priory churchyard was this 19th century headstone for the Patton family of Ballykeel. There aren’t many 21st century examples of the Ballykeel name, but I found this one on the Ballymiscaw Road. 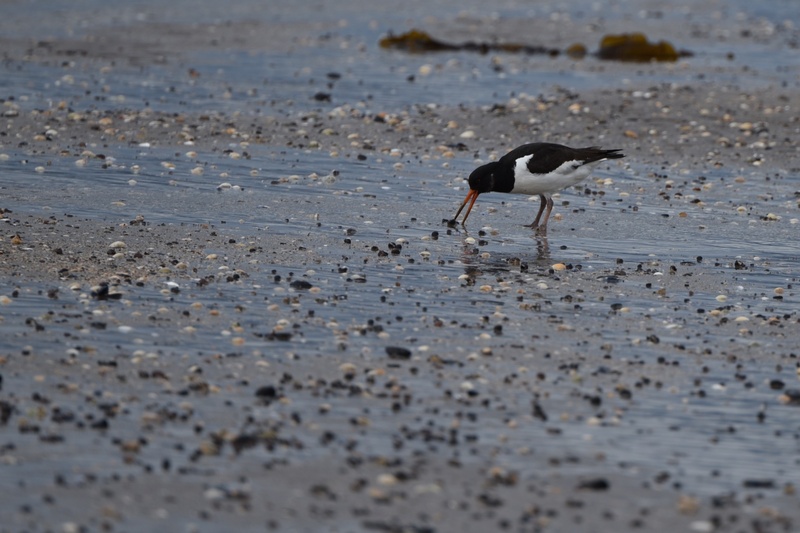 I started in the hills, so I should finish at sea level, with the railway, the shore of Belfast Lough, and my regular favourite – the oystercatcher. Which county is Ballykeel in? County Down. Which civil parish is Ballykeel in? Holywood. 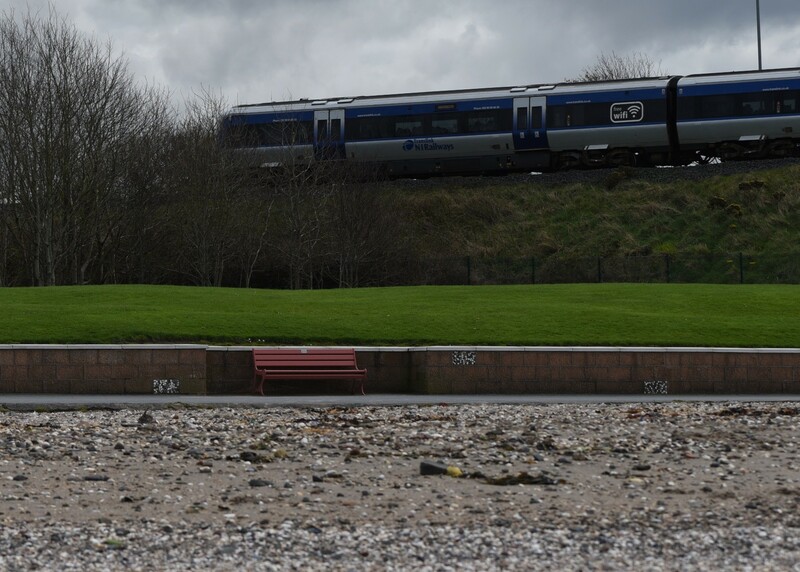 Which townlands border Ballykeel? To the north, Ballymenagh. To the southeast, at the top of the hill, Knocknagoney, Ballymiscaw, Ballyregan and Dunlady. To the south, Holywood. To the west, Belfast Lough. Click here to read more about the name of the townland on the PLACENAMESNI.org website. Cool someone is still keeping tabs on these old areas before they fade into the mists of time. Love the priory, and the woodland path! Will be visiting the area next month from Canada. 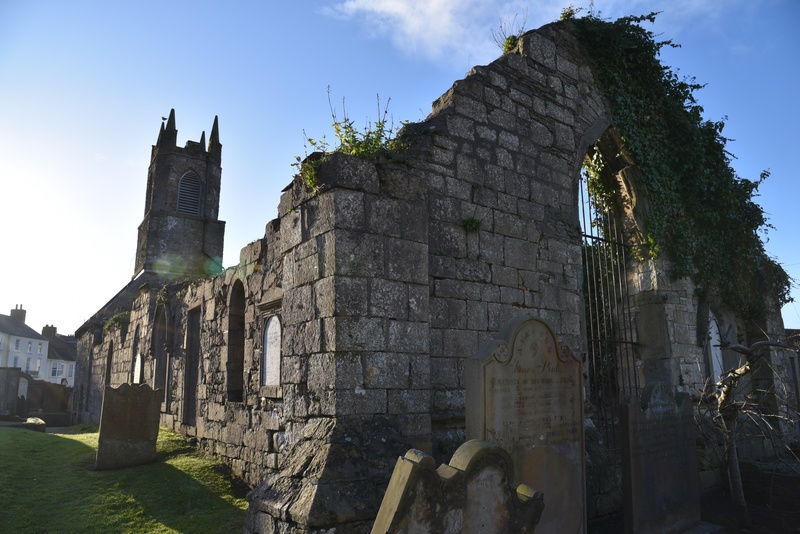 My great grand uncle Henry Magill lived in Ballymenoch House and is buried in the Priory graveyard. Another branch of my family tree is from the Holywood area – the Vinycombs. John Vinycomb was a well known bookplate artist in the late 1800s and worked for Marcus Ward & Co. His son Jack was an architect and retired to live in Rock Cottage, Ballygrainey Road, Craigavad in the 1950s. I hope you have a good time on your visit to County Down.